Shahak Shapira, who is Jewish, said he had reported 300 incidents of hate speech in six months, but Twitter had responded to just nine. A YouTube video has emerged showing Mr Shapira stencilling 30 tweets. "Germany needs a final solution to Islam," reads one. "Let's gas the Jews," says another, in reference to the Nazis' murder of six million Jews during World War Two. "If Twitter forces me to see these things, then they'll have to see them too," the artist said in the video, posted on Monday. He described the comments as "not just plain insults or jokes, but absolutely serious threats of violence". They include statements that are homophobic, xenophobic, or involve holocaust denial. He said the nine responses he got from Twitter said the tweets did not violate the site's rules. "I haven't received a single mail telling me a tweet was actually removed," he said. 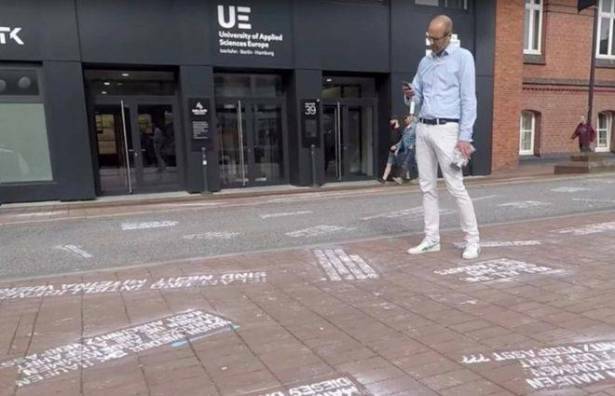 Mr Shapira explained in the video, titled #HeyTwitter, that he had made stencils of the hate-filled messages, then travelled to Hamburg to paint them in front of the platform's headquarters. "Tomorrow," he said, "they will have to look at all the beautiful tweets their company loves to ignore so much." Hate speech is an especially sensitive subject in Germany due to the crimes committed by the Nazi regime in World War Two. In June, the country passed a law which could force social media companies to delete racist or slanderous posts within 24 hours or face a fine of up to €50m ($58m; £45m). Mr Shapira said he had reported 150 comments to Facebook during the same six-month period, and 80% were removed within one to three days. Twitter's head of public policy for Europe, Karen White, told Reuters: "Over the past six months, we've introduced a host of new tools and features to improve Twitter for everyone. We've also improved the in-app reporting process for our users and we continue to review and iterate on our policies and their enforcement." The site is said to be acting against 10 times as many abusive accounts as it did this time last year. Mr Shapira previously made headlines after taking a controversial stand against selfie-taking at Berlin's Holocaust memorial. He copied 12 selfies snapped at the memorial from social media, and published them on a website called "Yolocaust" - a combination of the popular social media hashtag Yolo - "you only live once" - and Holocaust. Each image was altered so that hovering over it stripped away the background of the memorial and replaced it with scenes from concentration camps. He said at the time: "Lets see what happens, let's see how many stupid, inappropriate pictures I have to see on the internet. "And if you're asking me is this right or wrong, then that's a good thing. It doesn't have to be one or the other, just having the debate is good."